These pancakes may work well as appetizers or side dishes. On many occasions, when there is a dough involved, it may take a while to prepare due to the “inactive” time it requires to grow or rest. So this recipe needs preparation in advance, though it is worth to try! You may serve the wedges with ginger dipping sauce or even the Filipino Garlic Soy Vinegar Dip we used here. In a medium bowl sift the flour. Carefully pour the hot water and mix with a wooden spoon until a ball is formed. Knead for 2 minutes and place back in a bowl, covered with a tea towel. Leave to rest for 30 minutes. Make sure that the place is warm and there is no draft. Meanwhile, mix the sesame and vegetable oil in a small bowl and set aside. Wash the scallions and thinly slice. On a floured surface, knead the dough and with a rolling pin extend into a thin rectangle with the long side facing you. Brush the dough with the oil mixture, sprinkle the scallion, salt and pepper. With your fingers carefully roll up the dough. Cut into 4 pieces. Take one of them, coil it to form like a snail. With the rolling pin flatten into a circle about 0.5cm thick (1/4 inch aprox). Repeat with the other 3 pieces. Heat a pan and drizzle the remaining tablespoon of vegetable oil, place the pancakes and cook until golden brown on each side. Transfer to a board, cut into wedges and serve into plates with dipping sauce. Source: Adapted from Serious Eats. 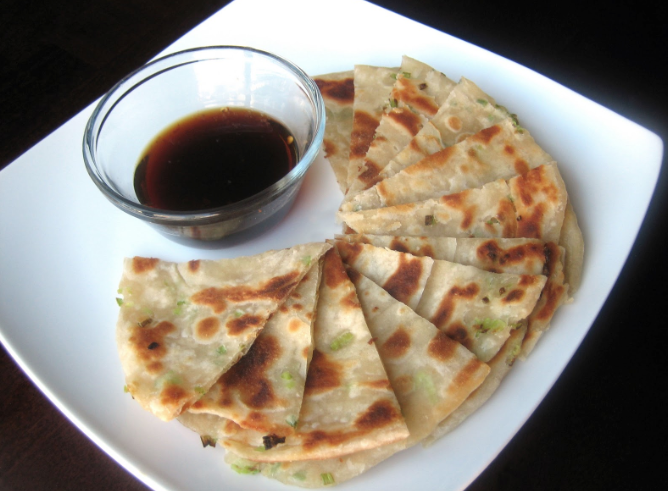 Categories: Recipes, Scallion | Tags: appetizer, asian, side dish | Permalink.